35 case studies featuring real-life clinical scenarios. Eugene R. Schiff MD, FACP, FRCP, MACG, is Professor of Medicine,?University of Miami Miller School of Medicine, and?Director,?Schiff Liver Institute/Center for Liver Diseases. 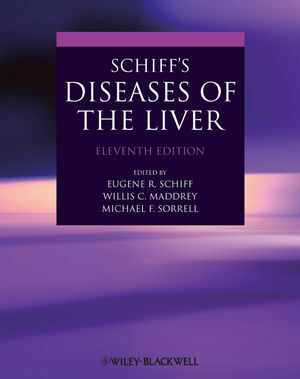 Dr. Schiff has authored 350 articles on liver disease and?is a past President of the AASLD and?past Chairman of the Biliary Section of the AGA. He was a member of the GI Subspecialty Board of the American Board of Internal Medicine and former Chair of the FDA Advisory Committee on gastrointestinal drugs. Michael F Sorrell, MD, FACP, is Professor of Internal Medicine, Nebraska Medical Center, Omaha, USA. He has edited Transplantation of the Liver and Gastrointestinal Surgical Patient: Preoperative and Postoperative Care, and has 206 articles on PubMed. Willis C Maddrey MD, MACP, FRCP, is Professor of Internal Medicine, University of Texas Southwestern Medical Center, Dallas. Dr. Maddrey has directed the liver unit at Johns Hopkins University School of Medicine where he was Professor of Medicine and Associate Physician in Chief. Dr. Maddrey is a past President of both the AASLD and the?American College of Physicians.